There’s nothing like a delicious meal that is quick to prepare after a day of hard work! 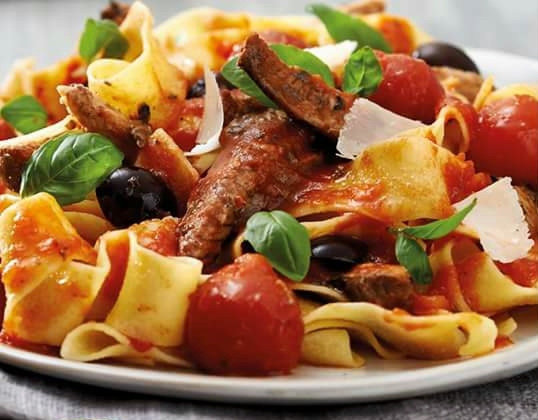 Try this delicious Sardine Pasta this evening to reward yourself for making it through a busy day. ↪1x425g tin of sardines, chopped. ↪2 cloves of garlic, crushed. ↪2 cups of chopped tomatoes. ⏩Cook the pasta according to the instructions on the packet. ⏩In a pot, fry the chopped onions until they are soft. ⏩Add the garlic and olives, and continue to cook over medium heat for 2 minutes. ⏩Stir in the sardines and continue to cook for 2 minutes. Add the chopped tomatoes and bring to a boil. ⏩Once it is boiling, reduce the heat to a simmer and cook for about 10 minutes, stirring occasionally. ⏩Add your favorite pasta and some cheese shavings as a garnish, and enjoy!